But they weren’t running, they were flying! This panel is just breathtakingly awesome according the colours and textures… They seem all to be “metallic painted” in this! Even the cloak of Nastajia…. Karaken was stunnable melee boss, while Nikodemus has magick as well. Alexander leveled up on some monsters, but I don’t think they can take down a dragon at this point. 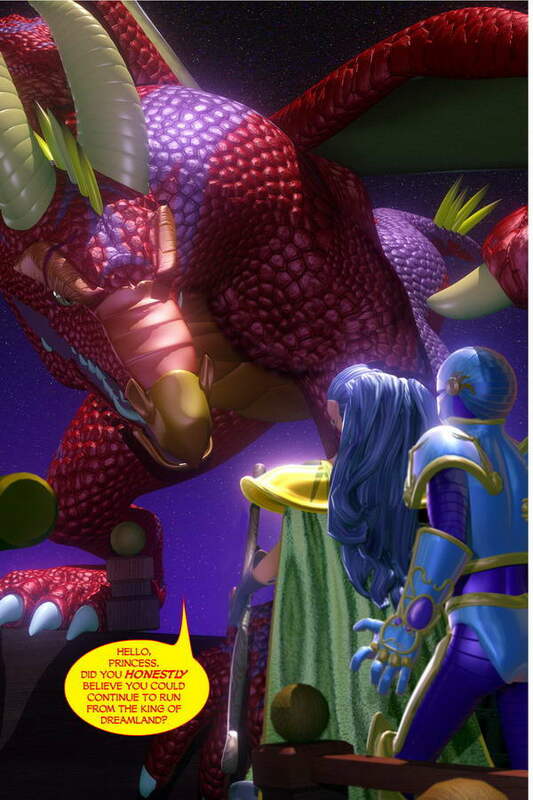 spyro has an evil stepdad? Hmm, his hide is bumpmapped, just like their hair. Now Alex, plunge the sword into the dragon’s chest, GO! Nick sure knows how to make an entrance. I wonder how the ship manages to support both a huge rock giant, the corpses of so many gargoyles and now a massive dragon? If you look, ol’ Nicky is clearly standing on the air ship’s railing. Oh well! Still a great panel. Don’t forget, that sword was used by Arthur; that makes it Excalibur! There is nothing that sword can’t cut through and the wielder is invincible in battle. I just about peed myself when I read that. You shouldn’t hold it in so long. Nick can’t weigh too much less than Paddington. The ship should be seriously leaning right now (though you could explain by saying that he’s still semi-hovering with his wings). Now if Paddington were to decide to tackle the dragon right now, (1) the resulting fall and impact, with Nick sandwiched between Paddington and the ground, might well do sufficient damage to kill a good sized dragon, and (2) there would be very little chance of the ship NOT capsizing, leading to each character desperately clinging to rigging, being rescued by Kiwi, or falling to their doom, depending on the whims of the author. This would be the first page out of the comic where Nicodemus genuinely looks intimidating. Oh, king eh? Very nice. And how’d you get that, eh? By exploiting the workers. By hanging on to outdated imperialist dogma which perpetuates the economic and social differences in our society. Stop worrying about freedom and don’t drop that mud!